Will PVR retain its No. 1 position in the face of new challenges? Will PVR Cinemas retain its No. 1 position in the face of the new challenges? 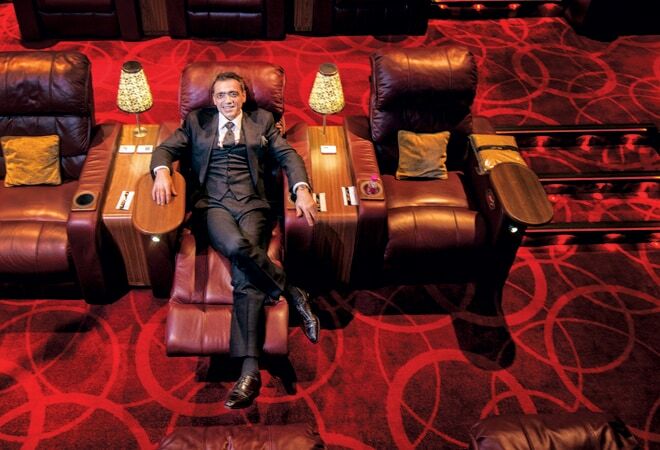 Ajay Bijli's PVR Cinemas brought the first multiplex to India, to Saket in South Delhi, in 1997. Many others with deep pockets followed in his wake, including corporate heavyweights such as Anil Ambani's Reliance MediaWorks (Big Cinemas) and DLF (DT Cinema). By number of screens owned, PVR briefly fell behind the Mumbai-headquartered INOX Leisure, a subsidiary of Gujarat Fluorochemicals. But in late 2012, it re-established its dominance by acquiring the Cinemax chain, with 135 screens, raising its total number of screens across the country to 469*. A series of major acquisitions in 2014/15, however, is seeing other players once again catching up. Foremost among the challengers is Carnival, a Mumbai-based group which owns 38 restaurants, but entered media and entertainment only five years ago. In July 2014, it purchased HDIL's Broadway Cinema, with 10 screens, for Rs 110 crore. It then acquired Ambani's BIG Cinemas with 254 screens for Rs 700 crore in December. (The deal is yet to be cleared by the Competition Commission of India.) The next month, it bought Stargaze Entertainment's Glitz Cinemas, with 27 screens, for Rs 90 crore, increasing its total number of screens to 346*. Carnival's acquisitions of Broadway and Glitz came at a higher per-screen valuation - Rs 11 crore and Rs 3.3 crore, respectively - compared with BIG Cinemas' Rs 2.8 crore as the two takeover targets had presence mostly in tier-II towns - considered growth markets - while BIG Cinemas was present mostly in the saturated metro markets. "We would like to create an institution," says Shrikant Bhasi, Chairman, Carnival Group. INOX, too, has been active in 2014, taking over the Delhi-based Satyam Cinema - with 38 screens - for Rs 182 crore in July last year. (Indeed, INOX has a history of inorganic growth and was able to temporarily displace PVR from the top slot only because of its earlier acquisitions of Calcutta Cine Private Limited's seven screens in 2007 and Fame Cinemas' 95 screens in 2011.) Then, in December, Mexican cinema-exhibition giant Cinepolis, which entered India in 2009, bought Fun Cinemas, with 83 screens, from Subhash Chandra's Essel Group, for an undisclosed amount. "When we came in, we were 20th in the pecking order, but we are now the fourth-biggest," says Ashish Shukla, Business Head - Exhibition, Cinepolis India. INOX's screen tally is now 365 and Cinepolis's, 193. "I never imagined so many acquisitions would happen at one go," says Bijli. "We should not underestimate anyone. Carnival is a very new player. It is growing more inorganically than organically." But he believes his strong focus on movie exhibition, which is PVR's core business, will make all the difference. "Everyone who is in this business has a reason for doing so, and so does everyone who gets out it. Film exhibition was not the core business for those who have exited. Such people, if they get a good valuation, exit. Even Carnival's core business is not exhibition," he adds. What he refuses to confirm is that PVR may soon increase its screen lead as well, as market whispers claim it is in talks to acquire Chennai-based SPI Cinemas - better known in the South as Sathyam Cinemas - with 40-odd screens. Similarly, INOX is said to be looking at acquiring a majority stake in DT Cinema. Bijli also insists that screen tally alone cannot be basis of market leadership - location and quality of cinemas matters, too. "Our strategy is to locate our theatres in malls which are both shopping and entertainment destinations," he says. PVR's Chief Financial Officer Nitin Sood stresses PVR has a far bigger presence in Tier-I cities and prime areas within these than closest rival Carnival. "If Carnival's 400 screens garner Rs 400 crore a year, PVR's 400 screens would get Rs 1,500 crore," he says. "Though we are bigger than INOX, INOX is a stronger competitor [than Carnival]." But even more important is the quality of the movie experience provided. "Acquisition is not simply a matter of changing the logo of the screen from the previous owner's to PVR's," says Bijli. "First we upgrade the essence of the hall - the seating, the carpeting, the technology. Only then do we change the name and logo." Only 13-14 of the 38 properties - amounting to 135 screens - PVR acquired from Cinemax have been redone and given the PVR logo so far. But PVR is not alone in focusing heavily on this aspect; its rivals are doing the same. If PVR screens provide wider seats, for instance, than Cinepolis theatres allow more leg space. "We lose one or two rows because of the extra leg room we provide, which amounts to 15 to 20 per cent of total revenue," says Shukla. "But we are willing to lose out on business to bring back patrons. Our overall occupancy rate is higher than the industry's 26-28 per cent." How much difference does improving the theatre experience make to revenue? Bijli says the acquired properties PVR has renovated have shown a 10-15 per cent increase in revenue so far. "Our pay per head, or the average earning per moviegoer, has gone up 12 per cent in the April quarter of 2014/15, compared to the corresponding quarter last year," adds Alok Tandon, CEO, INOX Leisure." Ticket prices can be raised, but what really increases revenue is more income from food and beverages (F&B), and from ad films and posters. PVR, for instance, has put in Rs 3 crore to upgrade the six-screen multiplex at Subhash Nagar, West Delhi, it acquired from Cinemax. "In the first year itself, revenue increased by Rs 2-2.5 crore," says Sood. "Within the next 18 to 24 months, advertising increased by 50 per cent, while F&B revenues went up by 40-45 per cent." Analysts note that the F&B trend is in keeping with that in the West. "The share of tickets and F&B is 50 per cent each in the West, while in India F&B garners 30-35 per cent, depending on the multiplex," says Jehil Thakkar, Partner, KPMG. So too, while overall theatre revenues have a compound annual growth rate of 11.9 per cent, cinema advertising grew 25 per cent in 2014. "Our advertising revenue almost doubled from Rs 14.5 crore in the third quarter of 2013/14 to Rs 28.91 crore in the third quarter of 2014/15," says INOX's Tandon. No doubt 50 per cent of total box-office collections still come from Delhi-NCR and Mumbai, but multiplexes in smaller towns and cities have also been growing, while single-screen theatres have been shrinking. "Single screens have 1,000-plus seats which are very difficult to fill," says Bijli, adding that he would never buy one. (Multiplex screens have around 250.) Many of the acquired properties are in Tier-II and Tier-III towns. The consolidation thus will enable the big players to move into new territory. With the Cinemax acquisition, for instance, PVR has already entered Bhopal, Jalandhar, Raipur, Bilaspur, Ranchi and Bokaro, among other places, while the Glitz acquisition will take Carnival into Dehradun, Ranchi, Rohtak, Bilaspur and Jodhpur. It is not an unmixed blessing, as it will inevitably lead to a more expensive - if better quality - movie experience in these places, where purchasing power hardly matches that of the metropolises. "Films will increasingly cater to the higher income group as 80-90 per cent of the population cannot afford multiplex charges," says film director Shekhar Kapur. "Consolidation also increases the powers of a few theatre owners and producers." Film producer Guneet Monga, Co-founder of Sikhya Entertainment, believes it will tilt the power balance between producers and exhibitors. "The top three to four exhibitors will have greater bargaining power as they will control the maximum number of multiplex screens," she says. "This will also reduce the importance of film distributors." Consolidation has also begun attracting private equity capital. Bijli was able to fund his Cinemax acquisition largely because PE firms, Multiples Alternative Investment and L Capital, invested Rs 153 crore in it. "Ajay Bijli has professionalised the entire exhibition industry, taking external capital and sticking to quality of service," says Renuka Ramnath, Multiples' founder. "And external capital has helped him grow and enhanced his company's reputation of being professionally run." Indian chains are still small by global standards, with the US's Regal owning 7,000 screens and China's AMC, 5,000. "As Indian exhibitors grow bigger, touching the 750 to 1,000 screen mark, they could well attract global attention, both from investors and buyers," says KPMG's Thakkar. Organic growth of multiplexes is also happening, albeit on a much quieter note. Though India produces more films than any other country, it has only 6,600 screens - 1,600 multiplex and around 5,000 single screens - while China has 26,000 and the US - with its far lower population - 40,000. The scope for new screens is immense. "We will open about 100 screens a year organically," says Bijli. "There are a lot of players fighting for space in the malls that are coming up. But we're sure most mall developers prefer us as anchor tenants to others." (Anchor tenants are leading tenants whose reputation draws in others.) In coming years, Cinepolis, with its global experience, will open megaplexes: an 11-screen one in Kochi, and eight-screeners in Bangalore and Pune, are being built. *The article erroneously reported the number of screens for PVR and Carnival Cinemas. 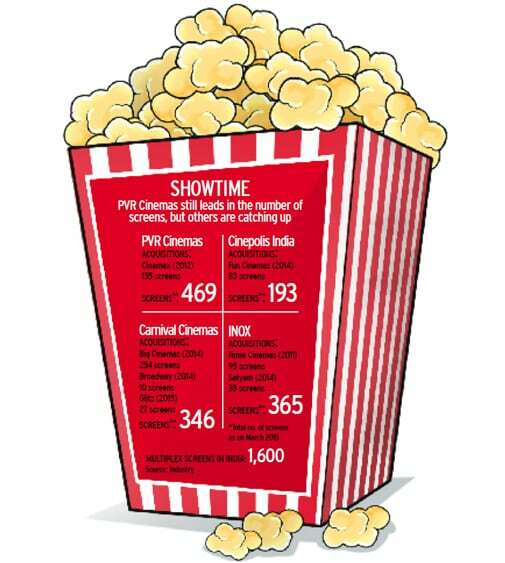 PVR has 469 screens while Carnival has 346 functional screens. The error is regretted.